We've now lived in this house for eight years. We know how the house works. We know how we live in this space--and what doesn't work for us so well. So we've been making some updates over the past several months. One of my favorite things about the kitchen updates I made this spring is the new chandelier in the breakfast area. We've used this space in many different ways over the years, but we finally decided that our extra-long table is a keeper, so we added a chandelier to the space. 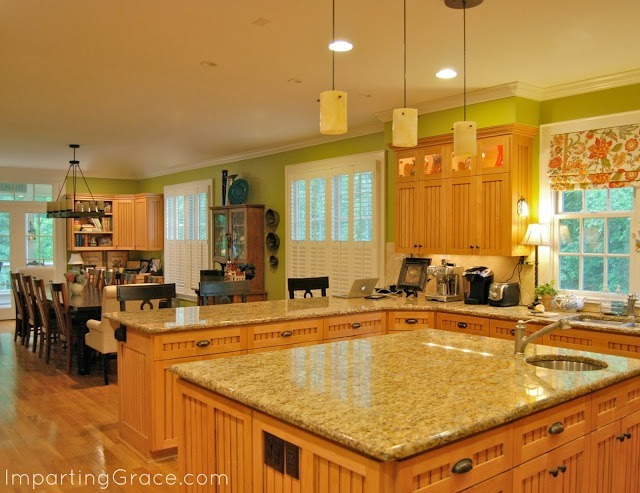 When we found the chandelier we wanted, I wished for new pendant lights over the island. Luckily, the pendant lights over our island were the easiest home improvement I've ever made--they're inexpensive light kits that simply screw into existing can lights. 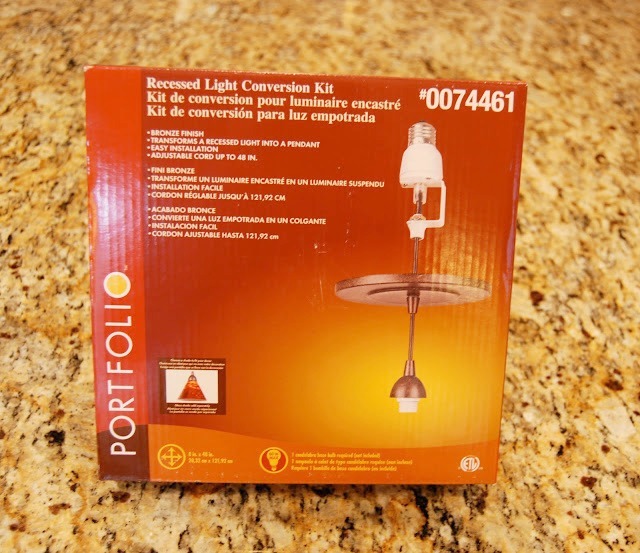 The only downside to using these kits is that the fixtures only accommodate a chandelier-sized light bulb, but that's really not a big deal. Here's how they looked for years. You can see the old wall color, a sage green, in the background. This latest update was even easier--I just replaced the shades on the pendants! The new shades were less than $10 each, so this was a very low-cost change. Someday I might bite the bullet and have custom pendant lights installed by an electrician, but for now these work just fine. I like the way these complement the new chandelier. Here you can see the pendant lights with the chandelier in the background. Some of you have asked when I'm going to share the updates we've made to our living room. My answer: as soon as I can! One last piece is still on back-order. Waiting for it has tested my patience, for sure. But the room should be done soon! Meanwhile, I have a few more plans for updates to our kitchen, but the next ones are going to take a bit more time. Slowly but surely, right? Lisa, you should definitely check out Ballard! Be sure to look for a discount code first. If you can't find one, let me know--I always have one lying around here somewhere! I found them to offer the best quality for a reasonable price. We actually ordered one fixture from another company and ended up sending it back! I really love how the pendants coordinate with the chandelier! 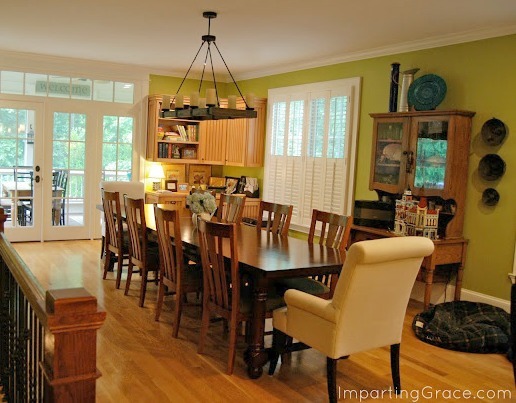 We recently converted our formal living room into our dining room (it's bigger than the room designated as the dining room), so that we could accommodate a larger table. 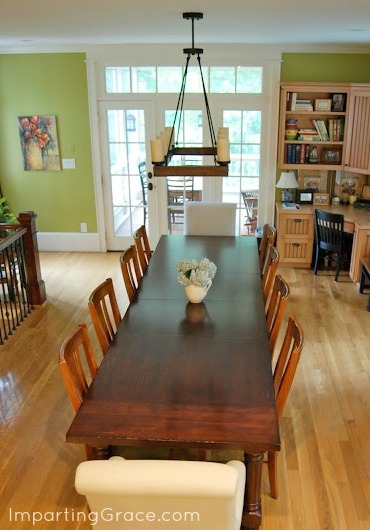 We love it, and like you, we wanted a large light fixture that fit the scale of the larger table. We ended up with the large Eldridge pendant chandelier from Ballard. It was a splurge for us, but we absolutely LOVE it! Our new dining room is open to the entry, and the room that used to be the dining room, which we converted to an office. We installed the medium Eldridge pendant in the office to coordinate. LOVE it! Just can't say enough how good lighting makes such a big difference in the feel of a room! PS - Your kitchen is dreamy! 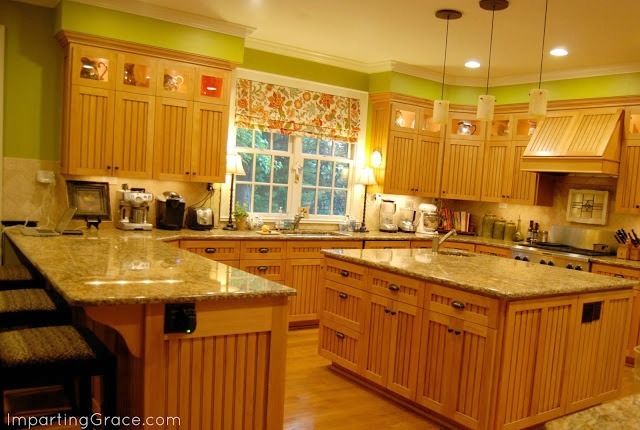 That island and all that counter space! 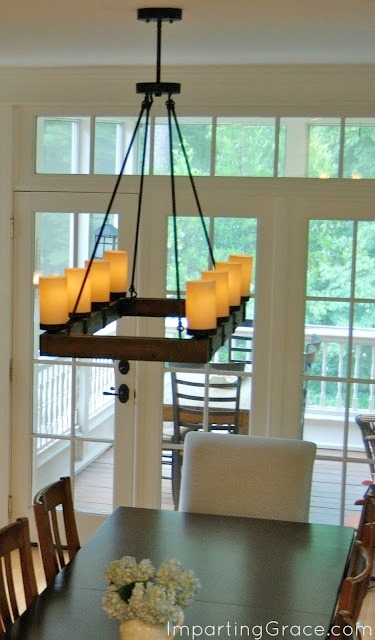 I think light fixtures are one of the best ways to change things up! Still looking for one for over my sink. I did copy all your grammer lessons, loved them! It is never out of style to learn and grow. So, thanks for another sweet post! Richella...The Chandelier and the pendants are great together, and look so nice! I really love your current paint color in the kitchen, (even thought the other color was nice too, but the little bit brighter color is really cheerful and pretty! Christy, I'll bet your dining room looks great! The Eldridge is a gorgeous fixture! I'm thinking of buying the round version of this chandelier. Would you do me a favor? I was thinking of removing the shades and just having exposed Edison bulbs, but I'm not sure how it will look. Can you show me what the socket looks like under the shades? PS - your house looks fantastic! Hey, I just wanted to make sure that my comment got through because I was posting on my phone and it was acting up. Sorry if it did go through and this is a duplicate! Your house looks fantastic! I'm thinking of ordering the round Arturo six light chandelier, but I was wondering how it looks without the shades. I want to have exposed Edison bulbs in it. If it's not too much trouble, would you mind showing me what the socket under the shade looks like? I've searched everywhere online and called Ballard Designs and there is no picture of this. 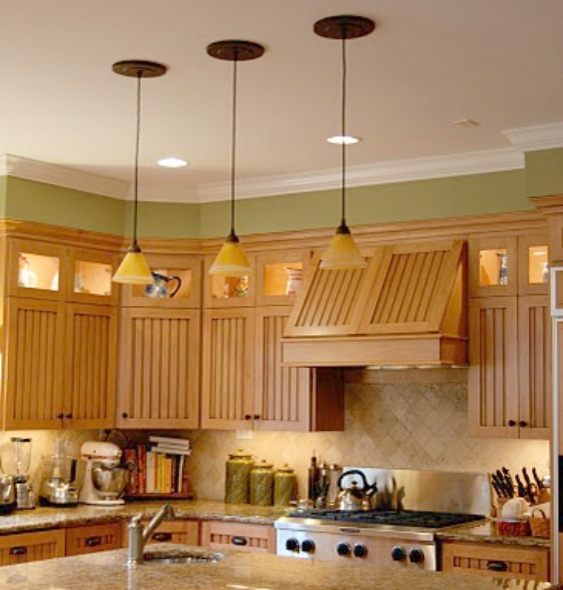 I have the Ballard Designs Arturo round 6 light chandelier in my kitchen and have been trying to find two lights to go above my island. I love what you have, as the pillar shades remind me of the pillars on the chandelier. Where did you find these shades? Thanks so much! We found these shades at Lowe's. They were on the shelf with the other shades that will fit the conversion kit. Note: they're a good bit heavier (thicker glass) than the shades on the Arturo light. That was in 2013, so I'm not sure if Lowe's still carries them, but it would be worth checking. I've given away the three shades that I had, or I would have been happy to send mine to you. Hope you can find some!